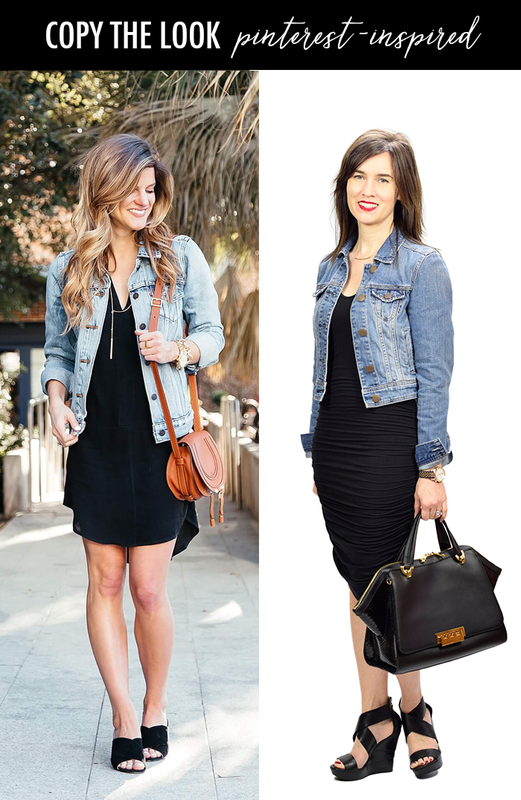 I am back today with our "Pinterest-inspired" series - and I am sharing a little black dress with a denim jacket, inspired by a look from Brighton the Day. You may remember a few weeks ago, the striped dress and denim jacket look was also inspired by her. This fun sweatshirt that laces up the back. This cute off the shoulder yellow top that is under $35 (and also comes in black and stripes). This popular Rebecca Minkoff bag is marked down 40%. This cute yellow ruffle jumpsuit - perfect for summer. This ruffle sleeve blouse with a fun crochet detail comes in three different colors. Be sure to link up your favorite posts (including fashion ones) with my friends at The Blended Blog. Brighton the day is one of my favorite bloggers and you recreated this look perfectly! A denim jacket is a spring must have for sure. You look so amazing in this dress, perfect recreation!! Sorry I haven't e-mailed you back yet I've had a chaotic week really hoping to connect with you while you are here! Enjoy your first day here, Niagara Falls is a blast, there's a great little restaurant called Antica Pizzeria that's a popular destination there just in case you are all in the mood for great pizza. You can't go wrong with classic denim and black! So adorable. Black and denim are one of my favorite looks. You can help me find cute stuff like this today when we go shopping! You always find the neatest pieces! Simple, but super cute! That black dress was made for you! Love the ruching! Oh girl! You nailed this recreation!! Well done!! I love a good black dress and jean jacket outfit! Such a good go-to!